At Ahmedabad there are many places that can visit on the tour of the city. The city has many ancient mosques and one such most famous mosque is Sidi Saiyyed Mosque. It is the last of the major mosques to be built in the city under the Mughal rule in the year 1573. It is built with yellow sandstone in Indo-Islamic style of architecture. The front of the mosque is very simple with two minarets on the sides of which now only the base exists. The monument is known for its exquisite ten semi-circular Jhali screens. Each one of these screens are just amazing. The rear wall is filled with square stone pierced panels in geometrical designs. 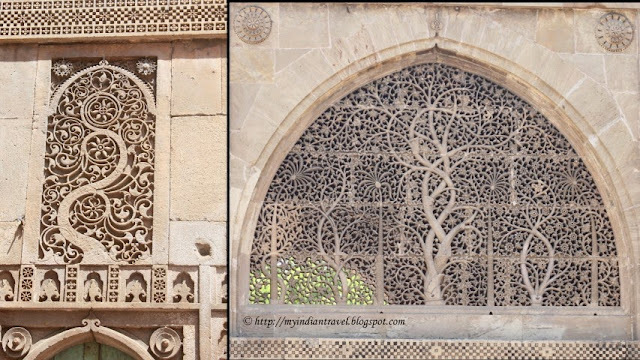 The carved latticework windows in the western wall are known worldwide and have become a symbol of the city of Ahmedabad. Depicting a tree with intertwining branches, the carvings look like fine lace filigree work, but are hewn from solid stone. As attested by the marble stone tablet fixed on the wall of the mosque, it was built by Sidi Saiyyed, an Abyssinian in the service of Rumi Khan, the second son of Khudavand Khan, the Governor of Surat during the 10th Gujarat Sultan Mahmud Shah III. Hello, I love the lattice windows, very pretty details. A lovely structure. Have a happy day and new week ahead! That a wonderful piece of history. Beautiful pictures. The stone carving here is the finest I have ever seen...such an artisan who crafted these....and each is mesmerizing....and out of stone...still amazes me. Is that a Tree of LIfe in the bottom photo? It is beautiful -- as is the whole place. Nice architecture -- the intertwining branches of the trees are much like a person's life. The arches really appeal to me. What an awesome mosque, Rajesh!! Superb captures for the day as always!! Thanks for sharing!! Have a great week!! The screens are so artistically beautiful. My jaw just dropped at that latticework, made from solid stone. You've shown some incredible things on this blog but this is one of the most impressive yet. Beautiful place (palace) and lovely photographs and narration - very nicely done! The tall arches make this building look so impressive, and the delicate carvings on the screens are truly exquisite! That lattice work is so pretty! The skill of those stone masons was phenomenal. Wow - I wonder how long that took to make, very impressive architecture. The 1st pic reminds me of the undergirdings of a bridge. I agree with Fun60: The skill of the masons is phenomenal and impressive. Me too, I cant imagine how they carved the lattice work! Beautiful! Such a beautiful Mosque, great architecture. what a beautiful architect .Mughal were rich in this field . The detail of the lattice work is amazing! Exquisite architectural details and the most beautiful stone latticework. Enjoyed my visit to Ahmedabad - this mosque was the highlight of my trip.